9/18/2008 2:04:40 PM Mountain DP:: Thank you Al, and thanks to everyone who comments and trade's the MoonTides. I'm been a observer of the Friday show for about a year and a subscriber for about 6 months. I haven't finished all the CCT courses but am working on them. I value and appreciate your comments and knowledge here. Cheers! 9/18/2008 1:48:58 PM Mountain TG:: Al, 1263, am I reading that right. wasn't 1218 160% of the moon to noon decline. 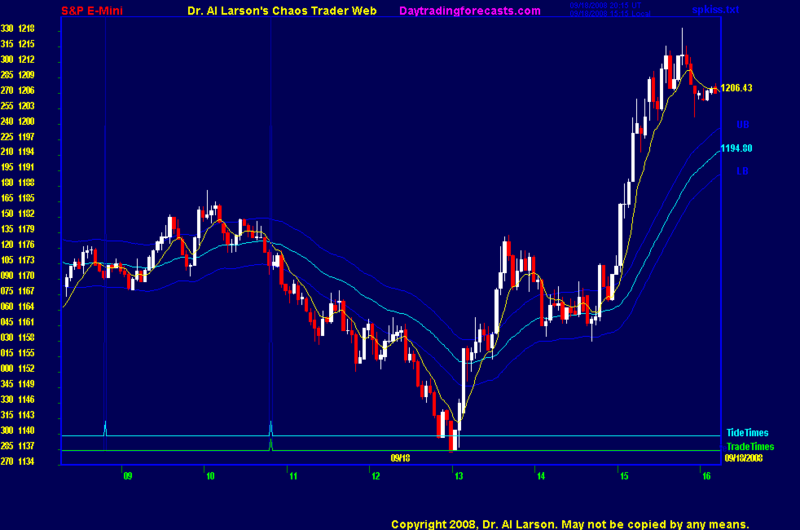 9/18/2008 1:48:23 PM Mountain DP:: Long at 90, stop at 07; Just below last candle bottoms. 9/18/2008 1:45:31 PM Mountain TG:: Hope it helped someone make a nice gain. I had what I considered a good morning and being up 40 for the week, I think my best ever so far, I decided not to try any non-hotline trades. 9/18/2008 1:44:40 PM Mountain DP:: Folks, this has been one of the best trading weeks I can remember. I haven't gotten 'em all, but I got my share. Thanks. I'm currently a refugee from Houston staying with relatives in Baton Rouge. Thanks for all the help. 9/18/2008 1:43:18 PM Mountain DP:: Al, You' been talk'n 2 Bernanke about moon tides? TG: well done on your Gann work! 9/18/2008 12:20:36 PM Mountain DP:: Thinking about positioning some of this weeks profits in overnight options. Just not sure which side (or both) to play. 9/18/2008 12:17:21 PM Mountain DP:: MoonTide harmonic grid is putting up some pretty good turning points. I'm wondering if +Tide tomorrow is up of down. Thoughts? 9/18/2008 12:15:01 PM Mountain DP:: In the trading game, specialist win, generalist lose! Stick to what you know; dance with the one that brung ya. 9/18/2008 12:12:40 PM Mountain TG:: 11 moves or 7 from 8/11, depending on how you count them but does sort of look like a quarter of a circle completed, but probably could have said that at yesterday's close and thought given that rally this morning the bottom might be in. Possibilities get sort of endless with the position trading. Worst losses I've ever made was due to mixing in poosition trading around with daytrading. Huge no no. 9/18/2008 12:02:06 PM Mountain TG:: Also, from that 8/11 high, I see on the daily chart what looks like about an 11 move CC type of decline. Looks potentially complete just eyeing it. 9/18/2008 11:56:28 AM Mountain TG:: From 8/11 high pivot, today's low was within +/- 3 points from 360 degrees in price and 1 trading day away from 180 degrees in time. 9/18/2008 11:50:12 AM Mountain TG:: Now, after the fact, found the right Square of 9 360 degree level for that 1:00 low pivot. 1313 cash high in August to this afternoon's low was exactly 360d at 1138. 3 below that was a standard throwover. 9/18/2008 11:42:55 AM Mountain DBJ:: Heck of a rally? Sure is! The 110 mean bands look TINY compared to the range of this rally! 9/18/2008 11:25:59 AM Mountain TG:: BTW, I said just for fun yesterday. I don't trade on that stuff anymore and often times the pivots are only very obvious after the fact. Now, of course looks like a throwover beyond 1143 and reversal on that general area. Just following moontides and CTME fractal grid I've been fortunate last 3 days but did 9 on the early trade Tuesday and stayed away from the FOMC later trade. 2 more 9s yesterday and this morning 9, -3, +7. Never risked more than 4.25 points per trade. If I did the Gann square of 9 "buy the falling knife on potential time and price squaring" I'd have bought at 1145-46 but would have needed huge stop to hold on to benefit from this rally. 9/18/2008 11:07:28 AM Mountain TG:: That's right on the margin but, yea, looking like door to 1070 super panic low is open. 1070 on 9/22 would actually match the 1314 to 945 drop back in May 2001 to Sept 2001 much better on the Square of 9 then 1143 would have as it would be the same number of complete revolutions, as opposed to one less at 1143. I just didn't think it was feasible. 9/18/2008 10:59:19 AM Mountain TG:: Meanwhile took two trades after initial 9 points made. -3, on continuation sell attempt (tough one with all that whipping) and then + 7 on last breakdown below 1152. 9/18/2008 10:58:09 AM Mountain DP:: So cash low is 1136.02; is that significantly below? 9/18/2008 10:51:58 AM Mountain TG:: 43, actually, on the cash, is 360 degrees on square of 9 from 1440 high back in May. Very similar decline to 7 years ago (has it really been that long). If blasts right past that level significantly, by 5 or more on cash, maybe does open the door to 1077 mentioned yesterday. 9/18/2008 10:47:45 AM Mountain DP:: TG; here's your 47 a day early; what next? 9/18/2008 9:32:54 AM Mountain TG:: I haven't looked at VIX much since 2001-03 timeframe. At times was an ok tool for position trading, don't see how it could be applied to daytrading emini SP. 9/18/2008 9:30:13 AM Mountain TG:: I took 9 out of that getting in late on what looked like move 5 of sharp CC that started near 10:00. Was a bad entry well below 110 but moving with a purpose so took the break of that 10:48-10:57 congestion (probable move 4 of sharp CC from 10:00). 9/18/2008 9:28:50 AM Mountain mag:: does anybody use the Vix chart as a trading tool? Vix has spike $16 since the first of september. 9/18/2008 8:54:17 AM Mountain DBJ:: I sold at 78, but then got whipped out. 9/18/2008 8:01:41 AM Mountain DP:: GM all. Yep, gotta love this volatility. Good trading today. 9/18/2008 7:06:18 AM Mountain mag:: good morning everybody!